Advice grilled to perfection from burger-flipping philosopher, Gerald Tritt. In this episode of Top 4 Barbecue Blunders, Vera’s Burger Shack Co-owner, Gerald Tritt explains #2 – The Squeeze – How pressing down on the patty dries out your burger and ruins an otherwise juicy hamburger experience. Share your barbecue tips in the comments below! For more information on purchasing 6-packs of Vera’s tasty fresh handmade burgers for you to grill at home, visit our website and our Facebook page. 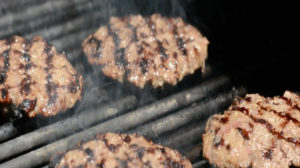 Gerald Tritt can help you avoid #barbecueblunders in order to cook juicy burgers like these! Vera’s Burger Shack began as a beach concession at Dundarave Pier in West Vancouver in 1977 under the watchful eye of Vera and her husband Frank. Vera prided herself on serving fresh, delicious, homemade food. She had a passion for looking after the people who would come down to the beach, sometimes daily, to get one of her tasty burgers. As Vera and Frank got older, they decided to temporarily hand over day-to-day operations to their granddaughters while Vera searched for the perfect candidate to carry on the Vera’s Burger Shack legacy into the new millennium. Enter Gerald Tritt, a family friend, and no stranger to a great hamburger. Gerald Tritt took over concession operations in 2000 with a promise to continue to build on the legend that began with Vera and Frank. Noah Cantor, another professed burger aficionado, partnered with him a year later to craft a burger experience all about fresh, delicious, homemade food in a friendly, comfortable environment. That’s why Vera’s only serves hand-crafted burgers freshly made in-house daily and prepared to order from top tier ingredients – each one joyfully assembled by great people who love what they do and who they do it for. On Gerald Tritt and Noah Cantor’s watch, Vera’s only uses fresh beef, and creates your burger just for you when you order it – so it may take a bit longer. Every Vera’s burger is cooked to an internal temperature of 160 degrees F, slightly pink in the middle, and delicious throughout. Our double-fried freshly cut fries, made from golden Kennebec potatoes, are more than slightly addictive. Our milkshakes are made with real ice cream from the milk of BC dairy cows and our signature Vera’s sauce is prepared fresh, in-house, and is so good, you might want to drink it straight from the cup! Vera’s has gone from a stand-alone shack on the beach in West Vancouver to 17 locations across the Lower Mainland and one lone shack in the Nation’s capital. Vera’s dream of an exceptional burger experience has grown into a network of well-run burger shacks led by a dynamic group of franchisees committed to Vera’s single, unifying vision of burger excellence. We hope you will love every one of your experiences at Vera’s. If you don’t like something, please let us know and we’ll fix it. That’s how we keep getting better. I think this is the biggest BBQ blunder and just dries out the meat! Leaving it be locks in the juices. Yumm!! Thanks for the comment. Yes, you need that flavour and juiciness locked in. The Squeeze….SOOO bad, drys it out , when the juices r squeezed out, some of the flavor will follow & it won’t be as tasty. The Squeeze is by far the biggest blunder. Just leaves dry burgers. Canada Turns 150 and you need plans in Vancouver! Soy Chicken and a great story!